Future sea-level rise is one of the most worrisome impacts that scientists say will result from global warming driven by fossil-fuel pollution. Researchers are working to refine projections of major aspects of anticipated sea-level rise such as the rate, timing and variation from place to place. As they do, an important question confronts people in oceanside regions such as the Texas coast – what could projected increases, typically expressed as a global average, mean in a specific place? Three recent reports don’t provide anything like definitive answers for Texas – they weren’t meant to – but do offer some hints about the sort of changes that may be in store. Last week, one study by an international team of scientists was published in the journal Science that concluded sea levels rose at least six meters – more than 20 feet – in periods of the distant past when temperatures rose only 1 to 2 degrees C (1.8 to 3.6 degrees F). Negotiators are now trying to reach an international agreement to reduce fossil-fuel pollution enough to prevent global warming of more than 2 degrees C – a temperature increase associated in key scientific assessments over the last couple of years with a projected sea-level rise in the neighborhood of one meter. 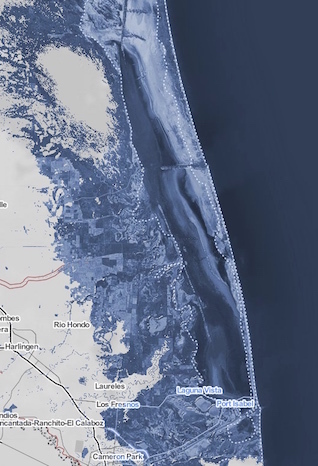 An independent research organization, Climate Central, separately employed the results of the study in Science to produce its own interactive mapping tool that shows what a sea-level rise of six meters would look like in different coastal areas. While an average six-meter rise was applied to all locations, scientists say actual increases will vary from place to place, depending on numerous factors. Along the Texas coast, the tool’s mapped changes are striking, to say the least – the inundation of Galveston, Matagorda and Padre islands, along with cities such as Port Arthur, part of Beaumont, Galveston, Texas City, the Freeport-Lake Jackson area and part of Corpus Christi. 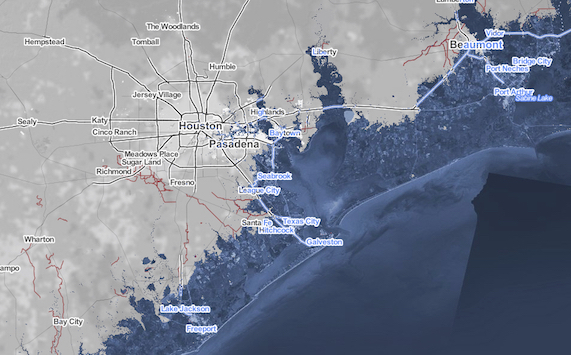 The three maps below are Climate Central’s portrayals of what a six-meter rise would mean in the Houston-Galveston-Beaumont, Corpus Christi, and South Padre Island areas. Studies have shown that both the Greenland and Antarctic ice sheets contributed significantly to [past] sea-level rise above modern levels. Modern atmospheric carbon-dioxide levels are today equivalent to those about three million years ago, when sea level was at least six meters higher because the ice sheets were greatly reduced. It takes time for the warming to whittle down the ice sheets, but it doesn’t take forever. There is evidence that we are likely seeing that transformation begin to take place now. 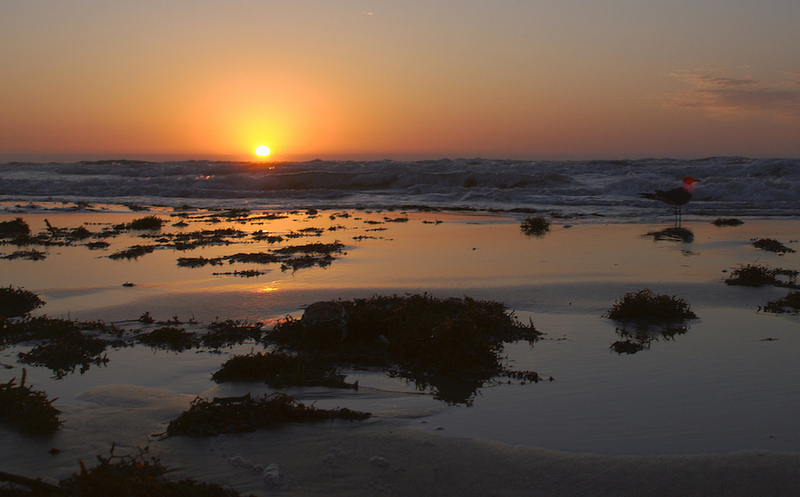 Padre Island National Seashore, a unit of the National Park System, comprises 70 miles of coastline on the narrow barrier island that stretches along the southern Texas coast. Padre Island separates the Gulf of Mexico from a shallow, hypersaline lagoon called Laguna Madre. 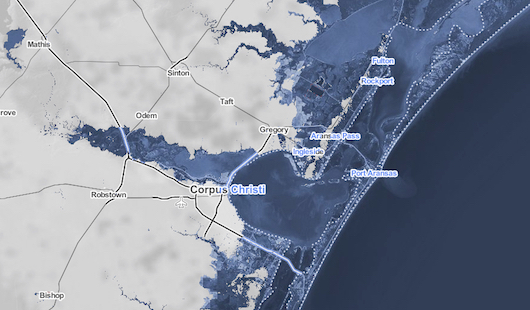 Various park “assets” of Padre Island National Seashore were deemed to be at high risk from a one-meter sea-level rise. Report authors assigned them a current replacement value totaling $40.9 million. They include roads, parking areas, a waterfront, a concession building and other facilities. The Park Service report authors’ use of a sea-level rise of one meter for their assessment was in keeping with major scientific bodies’ estimates in recent years. The Intergovernmental Panel on Climate Change, synthesizing a variety of previous studies in 2013, estimated an average sea-level rise of about one meter by the end of this century in a worst-case emissions scenario. The federal National Climate Assessment, likewise basing its appraisal on previous studies, last year estimated a rise of one to four feet by 2100.